Before I review this product, let me share with you how I learned years ago how to use Photoshop. It was not by doing tutorials, it was not by reading books or doing an expensive course with a live teacher, no it was by doing a video course, one that was about 13 hours. Before I started with that course I still had my doubts that it would be able to teach me in only 13 hours the most important tools. However watching a video course turned out to be very effective. I finished the course in less than a week and 3 months later I actually became a moderator on one of the most popular Photoshop forums during that time. Not because I was talented, but because I had a strong foundation that helped me to answer the most common questions. It's important that you finish a video course from beginning to end, because it allows you to see the whole picture and gives your the basic knowledge that is needed to learn how to combine multiple tools and which tool(s) to use for any specific problem. It will not teach you how to use all tools, but it will cover the most important tools. A good video tutorial will keep you concentrated knowing how much time it will take to finish. With a book you'll never know how long it will take to reach the end, so you tend to skip pages or chapters. With a video course people have the tendency to say; "Ok, let's be tough for X hours, but when I'm finished I have a good basic understanding of Photoshop". There is no need to hurry this course, because even when it takes you one month to finish it, in return you get many years of pleasure. I speak from the experience of thousands of Photoshop users when Is say; "Once you're hooked on Photoshop, you're hooked on it for a life time!" The product is available on 3 DVD ROMs. Note that DVD roms can only be played on a computer and not a DVD player. The product will run on both Windows and Mac OS operating systems and covers 36 lessons. The product contains additional bonus lessons on Vanishing Point and Smart Objects. It also offers 30 images from iStockphoto and your choice of one photo, illustration or font from PhotoSpin's collection. Deke McClelland is number one-selling author of books about computer graphics, digital imaging and electronic design who has written written more than 50 titles in the past decade and with over 2.5 million copies in print. Knowing that Deke McClelland put this course together should give most people some confidence about its quality. But let's see in the next part of this review if this is really the case. A simple click on the Install button was enough to start the installation. What followed was a QucikTime test, the program needed to watch the videos. The program will lead you to the proper download page if an installation or upgrade is needed. What follows are 3 installation steps. Project files (uses a few hundred MB hard drive space). 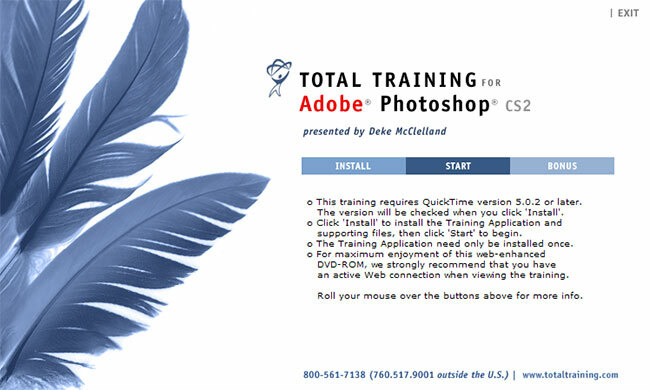 Course presets, so that your copy of Photoshop CS2 is set up like the original copy used for the course (1MB). Note: you can skip each step if needed. After installation it's just one click of a button to start the program and after a small video you will see the course interface. All in all I was very pleased with the simplicity of the installation and the flexible options. Let's look at the interface of the Total Training viewer, after all it's this program that the viewer will be using all the time. The interface has menus at the top and controls and additional menus at the bottom. The drown down menu in which you can select a lesson. Each lesson has a description and the length of the lesson in minutes. In this example the lesson "Clone, heal and patch" is selected. The drop down menu in which you can select a topic. In this example topic number 4 is selected: "The Healing Brush & the Options Bar". The bookmarks drop menu for your book marked topics. The video progress bar with underneath it in yellow the elapsed time. The little yellow square allows to jump to a specific part of the current video. Video controls. You can pause the video, fast forward and rewind at 2x or 4x speed and you can select the next or previous topic. The total running time of the current topic. A volume slider with beside it a mute button. This will show you the complete outline of the current DVD. 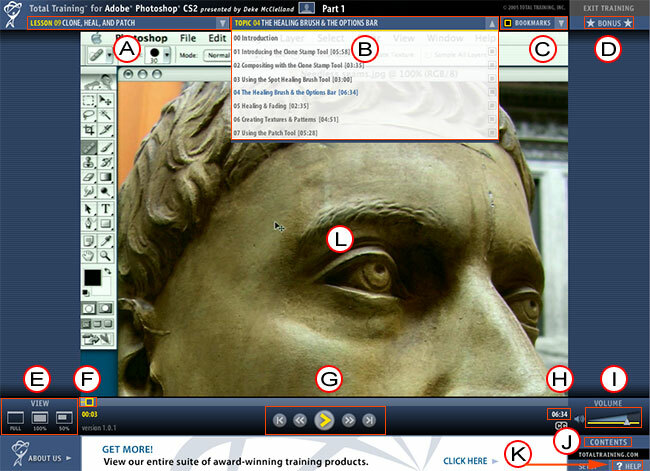 The help; it contains a video that explains the interface in more detail plus a screenshot with detailed explanations. The video area. You can pause the video by clicking on this area. I find the interface simple to use. It uses familiar icons and lessons and topics can be easily selected. The fact that you can bookmark a topic is a nice bonus. The contents button (K) can help you to plan ahead. The fact that Total Training took the time to make a short video tutorial (available in the help) that explains the interface in more detail shows their dedication. The course has tons of information to offer and it also translates in numbers; a total of 21 hours of video in 36 lessons and a total of 310 topics. I think it's fair to say that the name Total Training was well chosen, because the amount of information is overwhelming. Everything is also very well presented and important and useful introductions appear throughout the tutorial. Deke McClelland explains in great detail how each tool works, but on top of that he also shares tricks, shortcuts and multiple ways to do the same thing. Not only is this extra information very useful, but it also keeps the presentation exciting and the viewer focused. What's also important to me is that Deke McClelland has a pleasant voice to listen to, a voice that in my opinion also reflects Deke McClelland's excitement for Photoshop. Also important to know is that Deke McClelland doesn't stumble a lot, doesn't use words like "uh, ok, mmm" that might get on people's nerves, speaks in a normal tempo and articulates words and sentences very clearly, which can be especially important to foreign viewers. The incidental humor, the Da Vinci joke made me really laugh, also helps to make the whole course a very relaxing experience. These are important factors that make the listening experience very enjoyable, which is important if you have to listen to the same person for almost 21 hours. It's very positive that project files are included on the DVD; it will get the viewer more involved in what he's studying and gives him/her more confidence. The presented content is accurate and complete, something I honestly didn't doubt knowing Deke McClelland's extremely successful writer's career. At the end of this review I will sum up the strong and weak points and suggestions for improvement, but in general it comes to this; it's a very well presented course that offers tons of information that in the long run is worth every penny you pay for it. I'm convinced that this course can serve all beginners as a perfect foundation to expand their Photoshop knowledge. 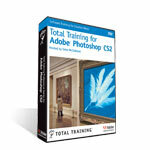 It's important when you want to learn how to use huge applications like Photoshop that you understand the basics. Basics in Photoshop are as important as the foundation of a house. A good understanding of the basics allow you to see the whole picture, the whole puzzle and how all the pieces (tools/ techniques) for together. This video course most definitely offers these important basics and often goes beyond that. Highly recommended. Video quality could be slightly better, but then again, better quality would have meant more DVDs and a higher price, so I can live with that. Some things should have had more attention and the pen tool is one of them. Again, I don't see this as a major issue, because I have to be fair; at some point you have to draw a line and I think with 21 hours of video on 3 DVDs and 310 topics Total Training have waited very long to draw that line. The fact that other things like the important masks and channels are discussed in great detail makes up up for the few things that are not covered in the course.